Nihad Taha, who has represented us in Gaza for the past 3 years has conceived, researched and made solid a facility for providing spectacles to poor children first, and poor adults second. 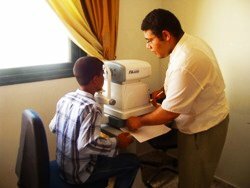 Eye tests will be carried out by a young graduate in optometry from the Islamic University and the lenses made. Frames will be imported as usual. The cost will be less than half of those available commercially. We will investigate whether the urine can be tested for sugar and the blood pressure measured when adults attend requesting spectacles. The set-up costs are modest (you might know that a Cruise missile, as used by the UK in the illegal invasion of Iraq, costs at least £500,000). The needy get their spectacles, some employment is created and a small part of the latent talent and energy in Gaza is released. Of course, it will also raise morale in a people who have never suffered so much (eg 85% now living below the poverty line) as a result of unlawful and immoral sanctions being applied as collective punishment to 'displaced persons', those persons being 'protected' in customary international law. We have written to the Irish government about this (future help was offered to DSH last October), and hope it will be able to assist the Dove and Dolphin Charity in funding this exciting project. The poor people in Gaza are often heard to say 'education is only for the well off'. Nihad has been given the go-ahead and money will be transferred. Very well done Nihad.